This is the time of year (hint: December 25) when stories abound of Israel's unfair persecution of Christians. Unsurprisingly, Reuters, for example, attempts to put the damper on the holiday spirit by once again castigating the separation wall (which has dramatically reduced incidents of terror) as the author of Christian misery in Bethlehem. In the end, the best writer Erika Solomon can come up with is a quote denouncing the wall as a "huge visual impediment" and the old line that it represents a "land grab and a tool to consolidate Israeli control of Jerusalem." Like most uninformed writers, she fails to mention that the United Nations did exactly the same thing when it recommended the internationalization of the Jerusalem district (see my previous post), which included Bethlehem! 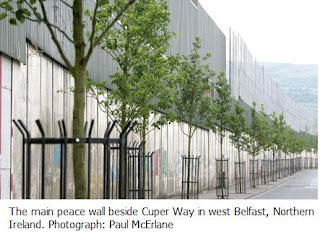 Writers also fail to mention the effectiveness of similar separation walls, such as one in Belfast which has reduced tensions and violence between Catholics and Protestants. Nevertheless, it's worth saying a few words about the status of Christians in Israel, Gaza and Judea and Samaria. It goes without saying, concern for Christian welfare in the region goes way back; I don't need to say too much on the origins and events of the Crusades. During the later centuries of Muslim rule, Christian communities enjoyed some good years and suffered some bad. Christians were subject to the same oppressive Dhimmi laws as Jews which required them to pay special taxes and obey rules meant to humiliate them into conversion. In many places Jews actually fared better; Christians were seen by many Muslims as idol-worshipers. As the Zionist enterprise picked up steam during the mid-20th century, Arab Christians (most of whom are actually descendants of Greeks, Armenians and Assyrians) were undoubtedly expected to take up the Palestinian cause. But, it's also likely many, especially those who had been living and working amongst Jews in Jerusalem and Haifa, were frightened of the prospect of an Islamic Palestinian state under the authority of Grand thug Al-Husseini. Most of the Christians appear to have sat out the war of independence; that's not to say they relished Jewish rule, but the alternative seemed so much worse. In Israel proper, Christians generally stayed put while their Muslim neighbours fled north and east. In the West bank, demographics changed overnight. Villages which had been predominantly Christian, such as Bethlehem (80% Christian before 1948) and Ramallah (90% Christian before 1948) became Muslim. Many Christians, who were generally well educated and enjoyed more economic prosperity during the British Mandate years, took any opportunity to leave. ...The position of many Christian communities in the Middle East is especially precarious in these days. The traditional tolerance of the Arabs towards minorities in their midst has been very much strained, and has not lessened since the recent developments in Palestine, or since the announcement of the withdrawal of British troops from that country and Egypt and Iraq. Even though these people are perforce siding at the present time with the Arabs among whom they are living, this country, and I hope my right hon. Friend recognises it, should use its utmost influences to check all hostile tendencies towards them and remind the Arab States that we should view the actual persecution of all minorities in their midst with the gravest disfavour." "Christians are being persecuted...in most Arab countries, regardless of their numbers there. The problem is that it is not only Arab officials who are remaining silent [in the face of these crimes] - [they do so] because their primitive mentality is centered on the cult of the ruler - but, alarmingly, so are Arab intellectuals, the elites, non-government organizations, and leaders of the private sector. All these groups look on at these unprecedented [acts of] folly without apprehending the danger with which these crimes are fraught." "Despite all the injustices [against the Christians], no one has seen or heard of any constructive action to curb it and to [defend] the Christians' rights - whether by the elites, by any of the three branches (executive, legislative, and judiciary), by non-government organizations, or even by the political factions themselves. [Such action should have been forthcoming] not out of kindness and compassion, but [due to] regarding Palestinian Christians as indigenous to this land, and [therefore] no different from us, with the same rights and obligations [as Muslims]. " "a systematic campaign of persecution...in the Gaza Strip, and to a lesser extent in the West Bank. The general silence surrounding this campaign aids its perpetrators. The victims are Palestinian Christians, in particular the small Christian community of Gaza." 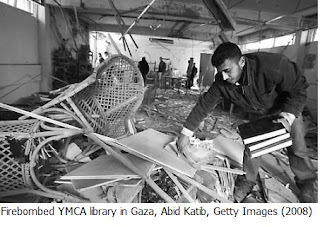 "The trend became noticeable with a series of attacks on the Palestinian Bible Society's 'Teacher's Bookshop' in Gaza City last year. The shop was the subject of a bomb attack in April 2007. 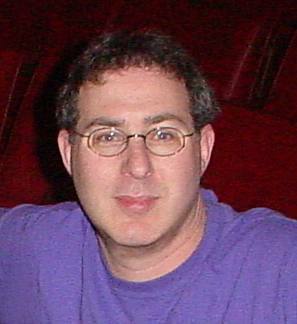 Its owner, Rami Khader Ayyad, was abducted in broad daylight, and found dead on October 7, 2007. Over the following year, a series of bomb attacks on Christian institutions in Gaza took place. Particular attention was paid to places of education. The Rahabat al-Wardia school run by nuns in the Tel al-Hawa neighborhood of Gaza City, and the American International School in Beit Lahiya were both bombed, most recently in May 2008. The Zahwa Rosary Sisters School and the El-Manara school, both in Gaza City, were also attacked this summer. The YMCA Library was bombed, as was the Commonwealth War Cemetery." A few weeks ago, a delegation of activists led by Reverend Majed El Shafie, President of One Free World International (OFWI), visited Israel for a conference on human rights and persecuted minorities. According to El Shafie (who was born Muslim but converted), "every three minutes a Christian is being tortured in the Muslim world, and in 2009 more than 165,000 Christians will have been killed because of their faith, most of them in Muslim countries." Sadly, there will be those who will choose to ignore centuries of Muslim harassment of Christians preferring instead to censure an Israeli wall or a few checkpoints. But, the history of the region speaks for itself; blaming these inconveniences for the eventual demise of this ancient community is like obsessing over a patient's hangnail while he slowly dies of cancer. Posted by Morey Altman at 12/24/2009 05:10:00 p.m.